Amaze attendees at your event with Pedal Powered Spin Art. It’s so easy it almost requires no supervision. 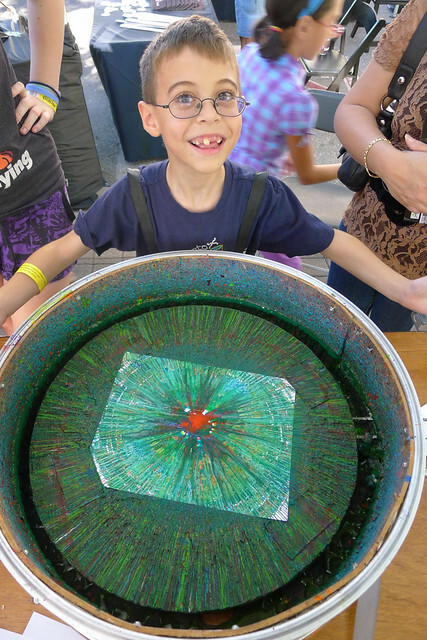 With just a few pedal strokes, you can get the platter of your Pedal Powered Spin Art station spinning at 1000-2000 RPM, enough to produce dazzling spirals, circles, and streaks as you squirt paint on the paper. Our updated design features a drum made from recycled plastic: making it lighter to carry and easier to clean. It also features a new handbrake to stop the spinning art smoothly, as well as an elastic cord to make paper changing easy and fast. Watch the video to see how to set up the Spin Art Machine. The spin art device comes with telescoping legs for big bikes or custom length legs for small bikes. The manual shows clear specs. Works with a Fender Blender Pro or Fender Blender Universale, so you can make a smoothies and art at the same time–or easily swap between the two! Kids flock to the station, staring in awe as the colors spin and splatter across the paper. Older kids or parents can pedal for youngsters. Children as young as five can enjoy this activity. Let them bring home artwork and memories from your event! Kids get excited, and want to use a lot of paint. To keep art looking good and clean we recommend watering down your tempera paint before hand and giving kids smaller bottles of paint. Paper sized 8.5″ x 11″, 5.5″ x 8″, or 5″ x 7″ works best. For extra branding, use paper with the company letterhead, or a stamp with your logo on it. You’ll also need a place to hang pieces as they dry, or a designated table to let them sit on. We use string and clothes pin, but we encourage you to be creative! Click here to read Rock the Bike tips for a successful spin art station. Customize your Spin Art attachment with your unique brand and logo! The recycled-plastic Spin Art drum makes a nice branding surface that perfectly complements the custom branding of your Fender Blender Pro. Branding on the Spin Art drum is $110 for the layout, printing and branding. If you’re placing an order for multiple bikes, each additional drum is $80. You can make and submit your own artwork or hire Rock the Bike to do it for you. To get the customization process going, please call us at 1-888-354-BIKE or email us your high resolution graphics and ideas or sketches of what you would like. Status: In Stock, ships same-day or next-day. This cost does not include a bicycle. The Spin Art attachment is compatible with any Fender Blender: Pro, Universale, or Xtracycle. What do I need for a successful Spin Art Station? Designing your artwork gives you complete creative control. Below we show your graphic designer how to submit your custom artwork for Wheel branding, Pro Frame branding, Spin Art drum branding, and Recharge Desk branding. If you need the template to complete your art please email us at customerservice@rockthebike.com. All wheel and drum branding artwork must be received print ready – 300dpi in PDF or TIFF file format – at least 3 weeks from your shipping deadline (as listed on your estimate/invoice). If artwork is not print-ready there could be a delay in production which could impact shipping and receiving deadlines. All frame and Recharge Desk branding artwork must be received as a vector file – .ai or .eps file format – at least 3 weeks from your shipping deadline (as listed on your estimate invoice). If artwork is too small to print there could be a delay in production which could impact shipping and receiving deadlines. Submit to brian@rockthebike.com. Once received a rendering of your custom art will be returned to you for final review and approval. Upon approval printing and installation will take roughly 3 weeks to turnaround. Avoid delays by reading more information below. The annual Burlingame Green Fair is spearheaded by the Citizens Environmental Council Burlingame (CEC), a fiscally sponsored non-profit project of Acterra: Action for a Healthy Planet. The first fair was held in 2008, making this the longest running green fair on the peninsula. The CEC is a group of volunteers whose mission is to champion a more environmentally and economically sustainable community. The organization provides leadership in local green efforts and an educational resource for residents, businesses and institutions. The CEC’s structure provides a vehicle for local residents to choose their environmental passions and make a difference in the community. This five-minute video shows you how to setup the spin art machine from Rock The Bike.